we are a leading Manufacturer of a wide range of Hydraulic Jack Accessories, Hydraulic Valve Coupler, 3 Or 15 Ton Hydraulic Jack, 5 Ton Hydraulic Jack, 8 Or 10 Ton Hydraulic Jack and much more. Established as a Partnership firm in the year 2016, we “Inox Hydraulic Industries” are a leading Manufacturer of a wide range of Hydraulic Jack Accessories, Hydraulic Valve Coupler, 3 Or 15 Ton Hydraulic Jack, 5 Ton Hydraulic Jack, 8 Or 10 Ton Hydraulic Jack and much more. Situated in Rajkot (Gujarat, India), we have constructed a wide and well functional infrastructural unit that plays an important role in the growth of our company. We offer these products at reasonable rates and deliver these within the promised time-frame. Under the headship of “Mr. Vivek Patel” (Partner), we have gained a huge clientele across the nation. Inox Hydraulic Industries is having vast experience of 20 years in this field of hydraulic along with customer satisfaction and quality maintenance. The Company has achieved reputation and trust within a very short span. Thanks to our user-friendly direct Marketing, for sighted & honest Business Policy. Continuous development & products improvement is our motto. M/S Inox Hydraulic Industries has continually worked to develop innovative and quality products and has earned a reputation for excellence in the hydraulic industry. 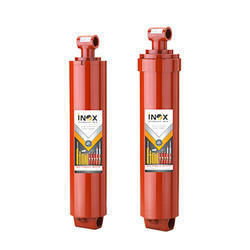 Inox Hydraulics' products are widely used in construction, infrastructure development, agriculture or Transportation etc. We have developed a huge advanced infrastructure facility to meet our production requirements and quality standards. We have equipped all the modern tools for high production rates.